SmithAmundsen, 150 N. Michigan Ave.
Moes Cantina, 155 W. Kinzie St. The CBA's Young Lawyers Section and HLAI invite you to join us November 14, 2018 for a Social Hour. Non-members are welcome. No RSVP Required. 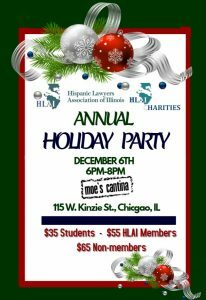 Free drinks while supplies last thanks to our sponsors: CBA Insurance Agency and Buchanan Reporting Inc.
Cava Room at Moes Cantina, 155 W. Kinzie St.
Join HLAI's LGBT Committee and HNBA as we celebrate Moses Suarez's historic presidency as the first Latino president of the Lesbian and Gay Bar Association of Chicago (LAGBAC). This is a free event with a limited open bar and RSVP is required. 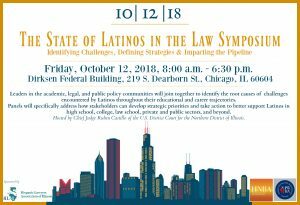 Please RSVP to president@hlai.org.